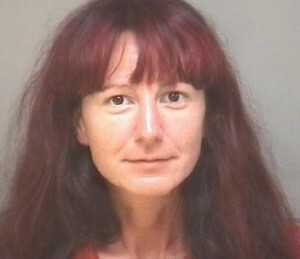 Elisha R. Strom, 35, of Bedford County, was arrested in Charlottesville in 2010 for allegedly stalking a federal agent. The arrest warrant was issued in Greene County, where the agent resides, according to the Greene County Sheriff’s Department. Strom was released on her own recognizance, though her laptop computer and camera are being held as evidence. Elisha Strom has been arrested twice before for following, photographing, and publishing personal information about members of the Jefferson Area Drug Enforcement (JADE) Task Force. Strom’s high level of interest in the Task Force apparently stemmed from a rift between her and JADE officer Brian O’Donnell, who, in his dual role as an FBI agent, worked closely with her during the trial of Strom’s husband, Kevin Alfred Strom, in 2007. Elisha Strom’s earlier arrests resulted in two convictions, one for obstruction of justice in October 2009 and another this spring for violating the court order to which she agreed after her initial guilty plea. According to the order, she was required to refrain from interfering with JADE operations and to remain a minimum distance from the task force offices and the task force members’ homes at all times. Strom was given a suspended sentences and fines, but continued to follow, photograph, and blog about law enforcement officers, including members of the JADE task force — but more recently expanding her area of interest to include Virginia State Police officers (some of whom were involved in her initial arrest), and members of the Federal Bureau of Alcohol, Tobacco and Firearms (ATF) who she claimed were harassing her. In addition to hundreds of photos and alleged insider information about the officers she targeted, Strom’s “I HEARTE JADE” blog contains lurid stories of her alleged sexual relationships with several officers. I’ve been following this woman’s antics in the news, and, while I don’t think police officers should have any more rights than anyone else, I am not convinced that she is a very good poster child for free speech. Her behavior screams psycho and I do not blame the officers or their families for being spooked by her weird and intrusive behavior. It’s not clear to me from this article what she actually DID that constituted stalking. And why are all the other news media keeping quiet about this? The police are public servants paid with tax money. Their activities and comings and goings should all be public knowledge.